Los Angeles, CA – From veteran multi-Emmy Award winning producer/composer Brian Tarquin comes this very special project featuring an incredible cast of musical virtuosos playing their hearts out for America’s fallen soldiers! 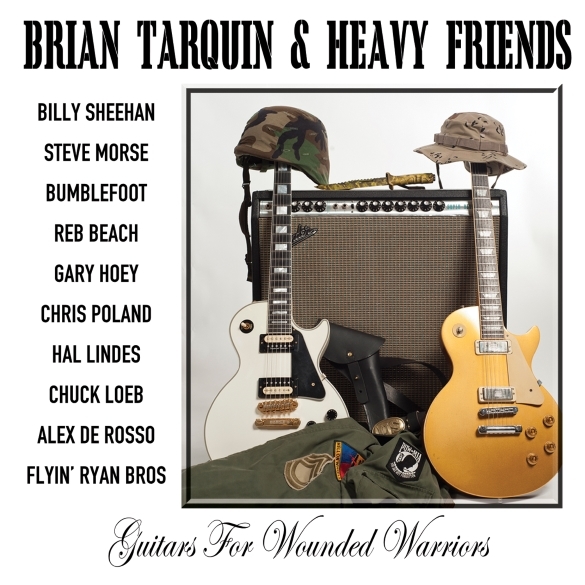 Tarquin produced, engineered and composed ‘Guitars For Wounded Warriors’, which showcases Tarquin’s guitar prowess on every song along side such world-class shredders as Steve Morse, Billy Sheehan, Gary Hoey, Bumblefoot (Guns N Roses), Reb Beach (Whitesnake), Hal Lindes (Dire Straits), Chris Poland (Megadeth) and Chuck Loeb. The album features exclusively released tracks inspired by those military soldiers who have fought for country. The Multi Emmy Award winning composer/guitarist Brian Tarquin has established himself as a top rate TV composer/recording artist and owner of Jungle Room Studios. In 2002, 2003 and 2005 he won an “Emmy for Outstanding Achievement in Music Direction and Composition for a Drama Series” and has been nominated for an Emmy 6 times. In 2006 SESAC honored him with the Network Television Performance Award. Tarquin first graced the Top 20 Billboard Charts back in 1997 with the commercial release; ‘This is Acid Jazz, Vol. 2’ on Instinct Records, followed by several solo jazz albums, which charted Top 10 at Contemporary Jazz Radio in the late 90’s. From 1996 to 2001, Brian recorded four solo albums, ‘Ghost Dance’, ‘Last Kiss Goodbye’, ‘Soft Touch’ and ‘High Life’ and has appeared in over 32 releases, selling over 140,000 records in his career.